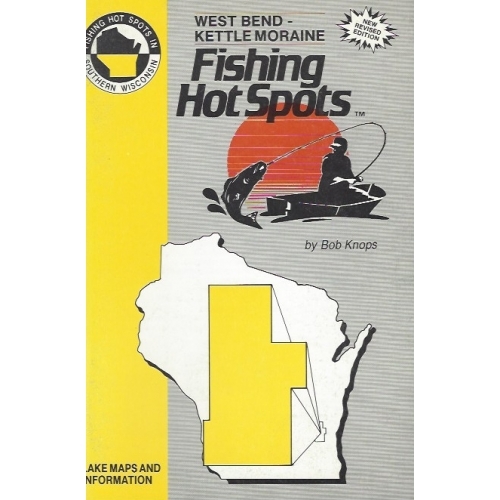 West Bend - Kettle Moraine Area Book - Vintage - Original Fishing Hot Spots Book by Bob Knops. Printing 1982. Limited Quantities Available. Please note: Shelf wear and stains may be visiable. 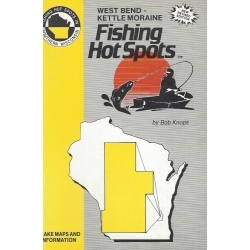 Lakes Included: Allerton Creek, Amy Belle, Auburn, Bark, ernice, Cedar, Big Cedar, Druid, Erlers, L.Fifteen Creek, Lake Five, Forest, Friss, Gilbert, Green, Hartford, Hasmer, Kettle Moraine, Kohlsville Pond, Lenwood, Little Cedar, Little Friss, Long Lowe, Lucas, Mauther, Milwaukee, Mueller, Pike, Silver, Smith, Stoney, Tilly, Tittle, Twelve, Wallace, West Bend.